NoSQL databases like MongoDB, PostgreSQL and Cassandra running huge volumes of data. Cloud-based data warehouses which can hold petabyte-scale data with blazing fast performance. Even traditional databases store big data—for example, Facebook uses a sharded MySQL architecture to store over 10 petabytes of data. The common denominator of these technologies: they are lightweight and easier to use than Hadoop with HDFS, Hive, Zookeeper, etc. Some are offered as a managed service, letting you get started in minutes. At the bottom of the stack are technologies that store masses of raw data, which comes from traditional sources like OLTP databases, and newer, less structured sources like log files, sensors, web analytics, document and media archives. Increasingly, storage happens in the cloud or on virtualized local resources. Organizations are moving away from legacy storage, towards commoditized hardware, and more recently to managed services like Amazon S3. 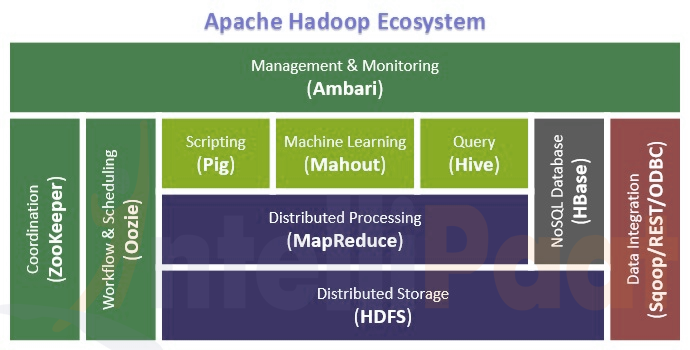 Hadoop HDFS—the classic big data file system. It became popular due to its robustness and limitless scale on commodity hardware. However, it requires a specialized skillset and complex integration of a myriad open source components. Amazon S3—create buckets and load data using a variety of integrations, with 99.999999999% guaranteed durability. S3 is simple, secure, and provides a quick and cheap solution for storing limitless amounts of big data. MongoDB—a mature open source document-based database, built to handle data at scale with proven performance. However, some have criticized its use as a first-class data storage system, due to its limited analytical capabilities and no support for transactional data. To create a big data store, you’ll need to import data from its original sources into the data layer. In many cases, to enable analysis, you’ll need to ingest data into specialized tools, such as data warehouses. This won’t happen without a data pipeline. You can leverage a rich ecosystem of big data integration tools, including powerful open source integration tools, to pull data from sources, transform it, and load it to a target system of your choice. Stitch—a lightweight ETL (Extract, Transform, Load) tool which pulls data from multiple pre-integrated data sources, transforms and cleans it as necessary. Stitch is easy to setup, seamless and integrates with dozens of data sources. However, it does not support data transformations. Blendo—a cloud data integration tool that lets you connect data sources with a few clicks, and pipe them to Amazon Redshift, PostgreSQL, MS SQL Server and Panoply’s automated data warehouse. Blendo provides schemas and optimization for email marketing, eCommerce and other big data use cases. Apache Kafka—an open source streaming messaging bus that can creates a feed from your data sources, partitions the data, and streams it to a passive listener. Apache Kafka is a mature and powerful solution used in production at huge scale. However it is complex to implement, and uses a messaging paradigm most data engineers are not familiar with. Thanks to the plumbing, data arrives at its destination. You now need a technology that can crunch the numbers to facilitate analysis. Analysts and data scientists want to run SQL queries against your big data, some of which will require enormous computing power to execute. 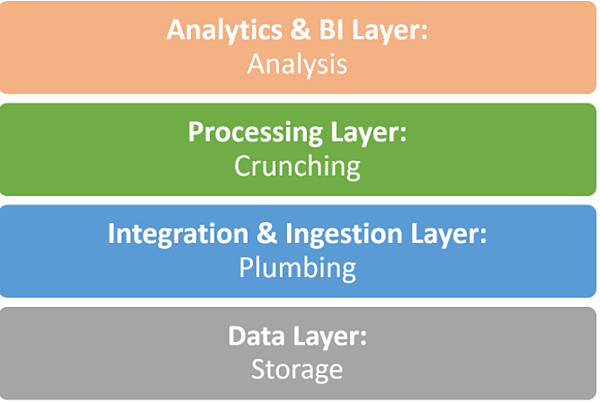 The data processing layer should optimize the data to facilitate more efficient analysis, and provide a compute engine to run the queries. Data warehouse tools are optimal for processing data at scale, while a data lake is more appropriate for storage, requiring other technologies to assist when data needs to be processed and analyzed. Apache Spark—like the old Map/Reduce but over 100X faster. Runs parallelized queries on unstructured, distributed data in Hadoop, Mesos, Kubernetes and elsewhere. Spark also provides a SQL interface, but is not natively a SQL engine. PostgreSQL—many organizations pipe their data to good old Postgres to facilitate queries. PostgreSQL can be scaled by sharding or partitioning and is very reliable. Amazon Redshift—darling of the data industry, a cloud-based petabyte-scale data warehouse offering blazing query speeds and can be used as a relational database. You’ve bought the groceries, whipped up a cake and baked it—now you get to eat it! The data layer collected the raw materials for your analysis, the integration layer mixed them all together, the data processing layer optimized, organized the data and executed the queries. The analytics & BI is the real thing—using the data to enable data-driven decisions. Using the technology in this layer, you can run queries to answer questions the business is asking, slice and dice the data, build dashboards and create beautiful visualizations, using one of many advanced BI tools. Your objective? Answer business questions and provide actionable data which can help the business. Tableau—powerful BI and data visualization tool, which connects to your data and allows you to drill down, perform complex analysis, and build charts and dashboards. Chartio—cloud BI service allowing you to connect data sources, explore data, build SQL queries and transform the data as needed, and create live auto-refreshing dashboards. Looker—cloud-based BI platform that lets you query and analyze large data sets via SQL—define metrics once set up visualizations that tell a story with your data. The Entire Stack in One Tool? Should you pick and choose components and build the big data stack yourself, or take an integrated solution off the shelf? Until recently, to get the entire data stack you’d have to invest in complex, expensive on-premise infrastructure. Today a new class of tools is emerging, which offers large parts of the data stack, pre-integrated and available instantly on the cloud. Another major change is that the data layer is no longer a complex mess of databases, flat files, data lakes and data warehouses, which require intricate integration to work together. Cloud-based data integration tools help you pull data at the click of a button to a unified, cloud-based data store such as Amazon S3. From there data can easily be ingested into cloud-based data warehouses, or even analyzed directly by advanced BI tools. Data—Panoply is cloud-based and can hold petabyte-scale data at low cost. Integration/Ingestion—Panoply provides a convenient UI, which lets you select data sources, provide credentials, and pull in big data with the click of a button. Panoply automatically optimizes and structures the data using NLP and Machine Learning. Data Processing—Panoply lets you perform on-the-fly queries on the data to transform it to the desired format, while holding the original data intact. It connects to all popular BI tools, which you can use to perform business queries and visualize results. Analytics & BI—Panoply connects to popular BI tools including Tableau, Looker and Chartio, allowing you to create reports, visualizations and dashboards with the tool of your choice. Most importantly, Panoply does all this without requiring data engineering resources, as it provides a fully-integrated big data stack, right out of the box. A data layer which stores raw data. An integration/ingestion layer responsible for the plumbing and data prep and cleaning. An analytics/BI layer which lets you do the final business analysis, derive insights and visualize them. By infusing this framework with modern cloud-based data infrastructure, organizations can move more quickly from raw data to analysis and insights. Data engineers can leverage the cloud to whip up data pipelines at a tiny fraction of the time and cost of traditional infrastructure. As an analyst or data scientist, you can use these new tools to take raw data and move it through the pipeline yourself, all the way to your BI tool—without relying on data engineering expertise at all.